Amenities: You have to be on a boat excursion to get to Molokini Crater, so everything you need will be provided – even your snorkel equipment and flotation devices. Parking: Don’t worry about parking; your captain and crew will make sure your tour boat is securely attached to its mooring at Molokini. The crew will explain how snorkeling works, and they’ll provide all the gear you need – even prescription dive masks! You’ll be swimming above Molokini’s reef in no time. Molokini Crater is one of the best snorkeling spots in Maui, and arguably, in the world! The impressive clarity of the water, diverse marine life, and spectacular coral reefs are what make Molokini a world-class snorkeling destination. The crater itself shelters a huge coral cove that is usually protected from high surf, so visibility there is fantastic. Because Molokini is a Marine Life Conservation District countless species of fish, coral, and birds who call the crater home thrive in their protected environment. When you visit Maui and join us for a boat tour, you’ll have the chance to see these creatures uninhibited in their natural habitat. Unsurprisingly, snorkeling at Molokini is at the top of many visitors’ “Maui Dream Vacation” bucket lists. In fact, it is estimated that almost half a million visitors to Maui snorkel at Molokini every year! The lush reef at Molokini is streaked with beautiful vibrant colors, not only from coral, but also from curious tropical marine life. With clear visibility as deep as 150-feet, you won’t miss out on anything, and because the marine life is accustomed to consistent visits from humans, they are relaxed in the presence of snorkelers and divers. 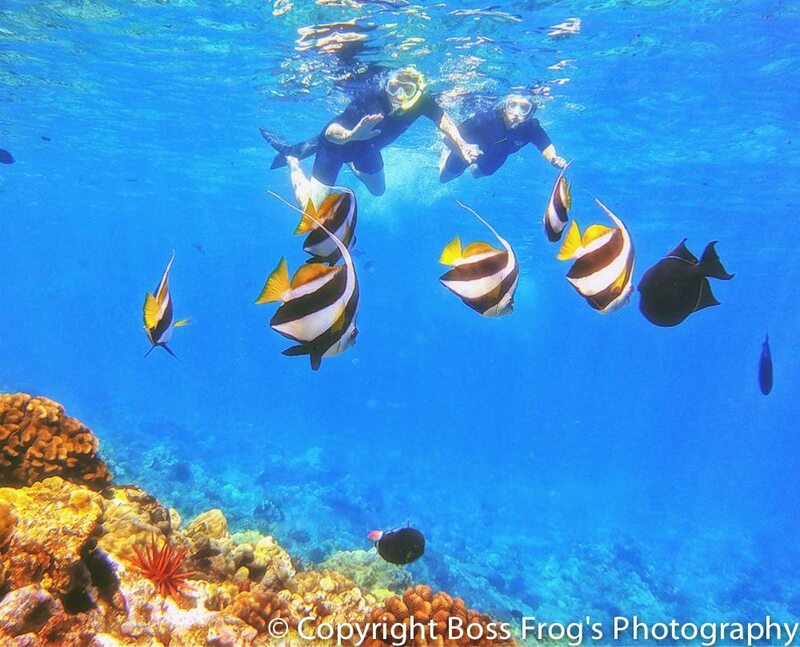 The best time to snorkel or dive at Molokini is in the morning when conditions are ideal. Pennant butterflyfish (also known as the Moorish Idol) – The Moorish Idol, known as kihikihi (curves) in Hawaiian, is closely related to surgeonfish and can grow up to 7 inches. They have a peaceful nature and are graceful swimmers. 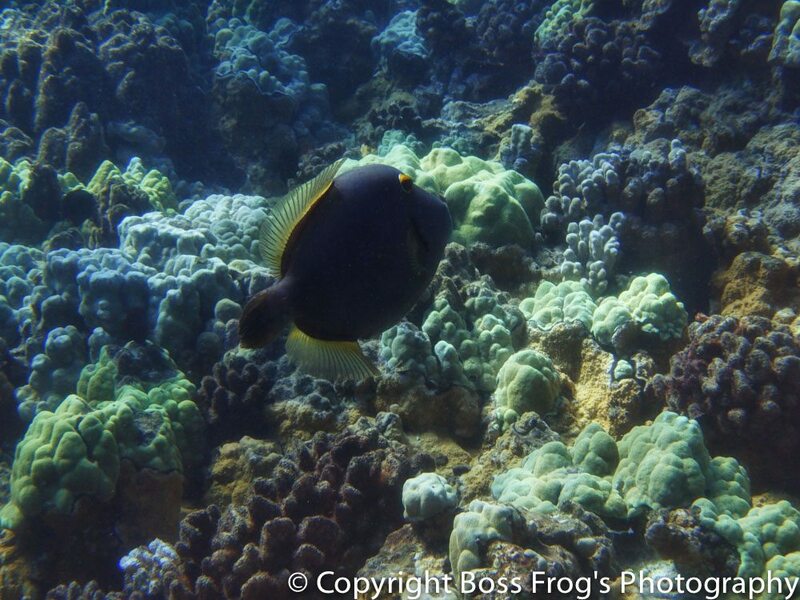 Black triggerfish – Known as humuhumuʻeleʻ (literally black triggerfish) in Hawaiian, they are black blimp-shaped fish with white lines that run along its fins. They can grow up to a foot long and can be found between 5 to 35 meters deep. Beautifully rainbow-colored parrotfish – The uhu, or parrotfish, is an exceptionally stunning fish with its rainbow-colored scales that are streaked pink and green. (This rings true for male parrotfish. Female parrotfish tend to be more muted in color, leaning forward a reddish-brown.) Parrotfish can grow up to 20 inches in length and are one of the most important fish living in the reef because they eat the algae that grows over the coral and inhibits sunlight from reaching it. Tobies – Hawaiian Whitespotted Tobies are small brown fish with white spots that are from the pufferfish family. They help the reef by eating red and green algae. Lauwiliwilinukunukuoiʻoi (long nosed butterflyfish) – Also known as the Milletseed Butterflyfish, this species of butterflyfish is endemic to Hawaii. 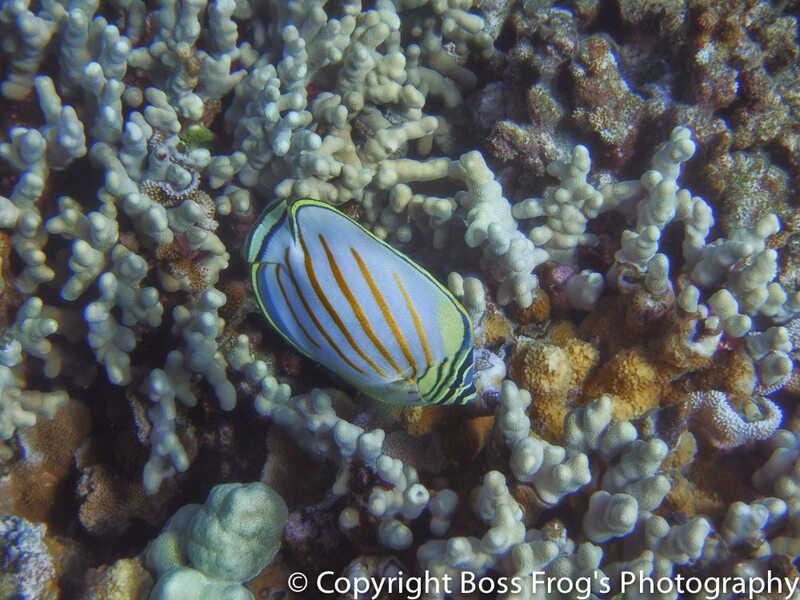 It is also the most common species of butterflyfish found within Hawaii. Known for their flittering movements and butterfly-like patterns, these fish feed primarily on zooplankton above the reef but have a tendency to be opportunistic and will eat damselfish eggs should the opportunity arise. On average, this butterflyfish grows up to 6.5 inches. Additionally, you may also see various eels, sharks (like the harmless whitetip reef shark), and rockmover wrasses, among so many other creatures. Whale sharks – Whale sharks, named for their size and the fact that they are filter feeders, are, in fact, sharks. These sharks are mild-mannered and curious, and very, very large. Able to grow up to 60-feet in length they are the largest non-cetaceans in the world. Despite their size they are truly gentle giants, and as with other sea creatures, should you encounter one of these marvelous giants in the wild, it is recommended that you do not harass or grab onto them as you may accidentally hurt them. Manta rays – One of the largest fishes in the ocean, with wingspans that can be up to 20-feet, manta rays are mysterious gentle giants. Despite their intimidating looks, they do not have stingers. Because they feed on microplankton, the odds of swimming with them depends on plankton levels in the water. For the safety of the manta ray, it is recommended that you do not touch them no matter how close they may get to you. 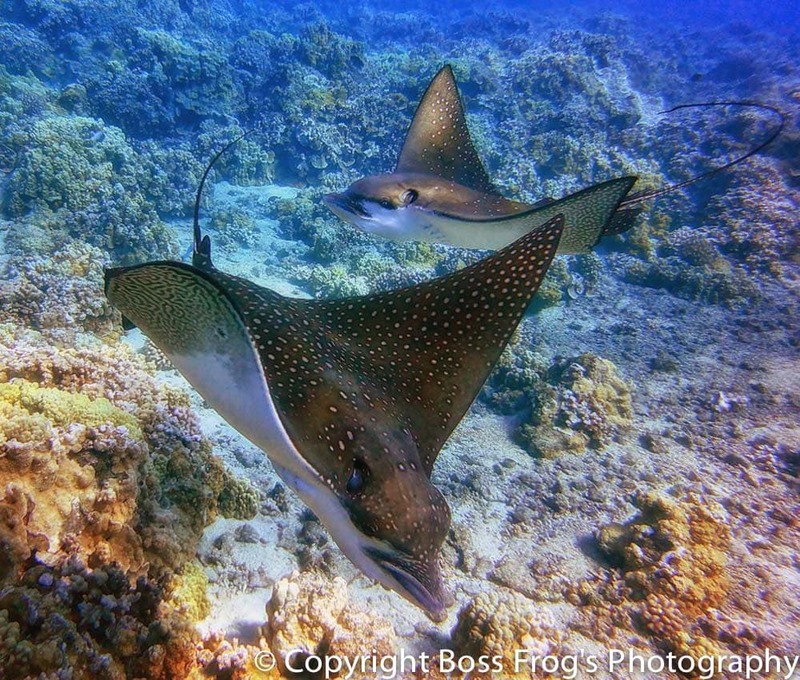 Did you know in 2009 Hawaii became the first state to introduce a ban on the killing and capture of manta rays? Due to the whims of Mother Nature, we cannot guarantee which marine creatures will be at Molokini during your tour—in fact, you may not even see the same fish more than once! However, you are sure to have the time of your life during your Molokini tour! 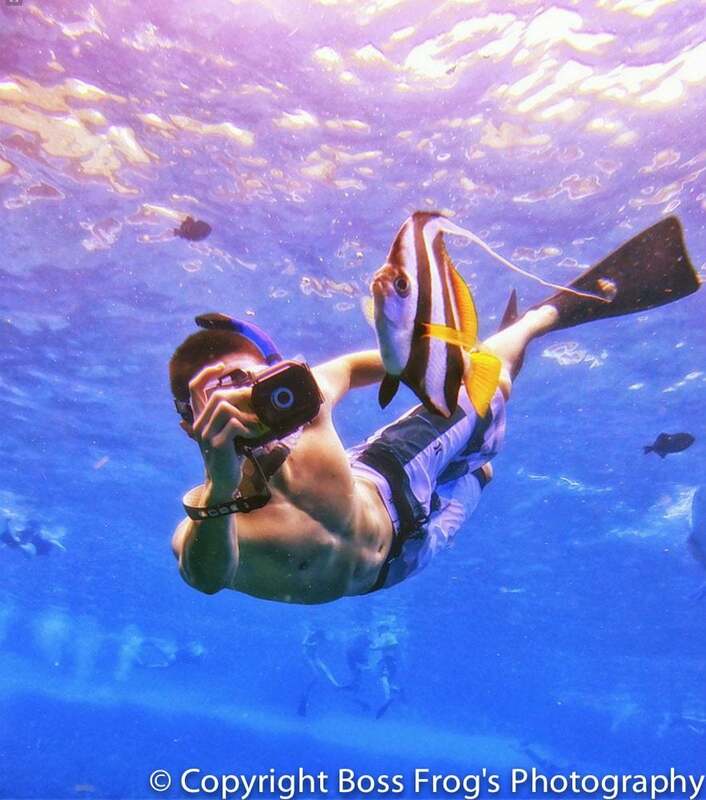 Because the fish living at Molokini are so accustomed to humans they are quite genial, which creates special photo opportunities for snorkelers and divers alike! Although the marine life at Molokini is extremely friendly, please be aware that as a part of current regulations fishing and the feeding of marine life is prohibited at Molokini. 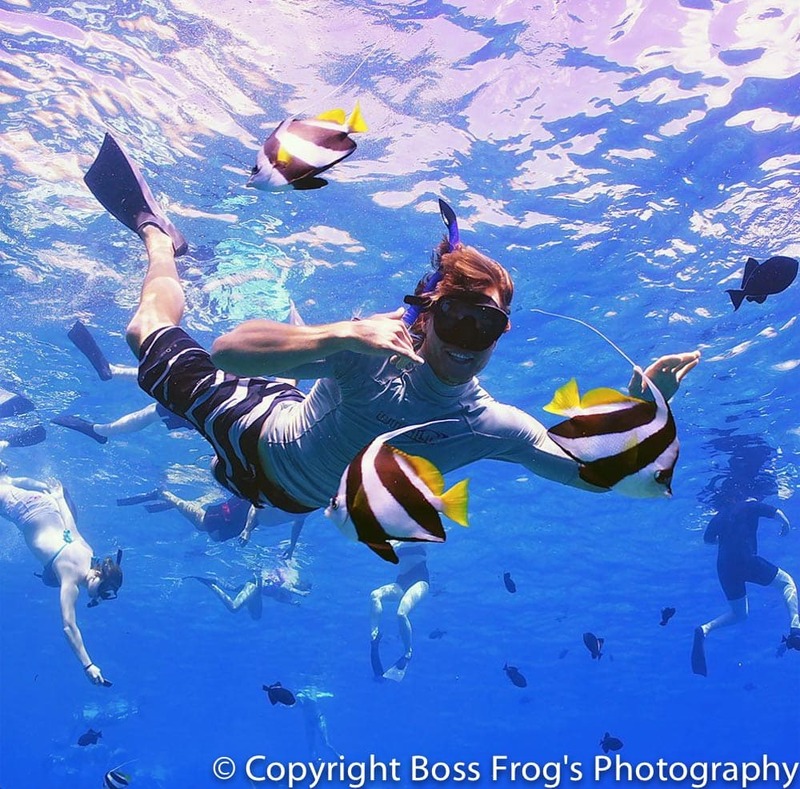 Not all of the creatures you see at Molokini will be underwater! Molokini is a great site for bird watchers to visit. As a federally owned state seabird sanctuary, you are likely to see the Bulwer’s petrel (Bulweria bulwerii), wedge-tailed shearwater (Ardenna pacifica), the great frigatebird (Fregata minor), and the brown booby (Sula leucogaster). We’d be remiss not to mention the types of coral that make up the reef at Molokini. There would be very little to look at if it were not for the reef because it is the basis for the entire ecosystem. If the reef were to die, fish and other creatures who rely on the reef for shelter and food would eventually die too. Rice Coral – Named for its rice grain-sized texture, it is one of the four most common corals in Hawaii. Mushroom Coral – These are some of the most colorful coral to inhabit reefs. They come in a wide variety of colors, including red, purple, and blue. Additionally, they can come in eclectic eye-catching patterns! Black Coral – Black Coral is the Hawaii state gem. Surprisingly, black coral is not strictly black, depending on the species. It is actually their skeleton that is black or dark brown. The living coral may be red, brown, yellow, orange, green, or even white! There are 14 species of black coral that can be found in Hawaii. Cauliflower Coral – Commonly found living in exposed shorelines and surge zones, this species of coral is the toughest of all coral species. 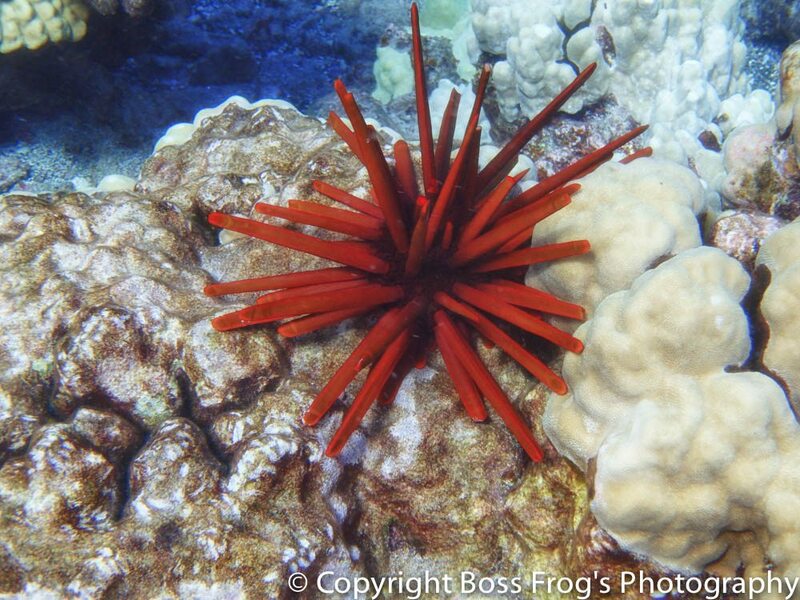 It is one of the most tolerant and abundant species of reef-building coral found in Hawaii reefs. Crustaceans, like shrimp and crabs, like to live in cauliflower coral. Orange Cup Coral – Nicknamed the sun coral, this non-reef building coral like to inhabit shaded, vertical surfaces, and as such, can be found under the ledges of Molokini’s wall. Although it is frequently called a crater, the islet of Molokini is actually a volcanic caldera. Although calderas begin as craters, the change begins when its subterranean magma chamber is exhausted, becoming wider and deeper. Once the magma chamber has been drained, the ceiling above it is unsupported and is likely to collapse—this is what created the distinct crescent shape that we associate with Molokini. In fact, it is the this crescent shape which protects swimmers from waves and powerful currents. In Hawaiian mythology the story goes that Molokini was an exceedingly attractive woman who fell in love with the same man as the fire goddess, Pele. In an act of jealousy Pele cut her rival in two—the head of the woman became the cinder cone near Makena Beach known as Puʻu Olaʻi, and her body became the islet of Molokini. Other known versions of the story say that the man was a Maui Chief, and the woman was a moʻo (gecko) and that Molokini is actually her tail. Research done by Kyoto University estimates that Molokini was formed roughly 230,000 years ago when it first erupted. Since its creation it is believed that Molokini has never been permanently settled upon. However, there is proof, through the discovery of ancient fish hooks and lures found by divers, that ancient Hawaiians visited Molokini to source food by fishing. It is also thought that they collected seabirds for the purpose of gathering eggs and feathers. When the United States entered World War II, the fate of Molokini was dramatically altered. After the bombing of Pearl Harbor, the U.S. military commissioned Kahoʻolawe and Molokini for practice as bombing ranges. Due to its unique shape, which is reminiscent of a battleship, the United States Navy used Molokini for target practice, leaving the southwest rim of islet pockmarked with craters and shrapnel. The Navy detonated unexploded munitions in 1975 and 1984, resulting in the destruction of a large section of fragile living coral. As of 2006, no evidence of any further unexploded munitions have been found on the islet. In addition to the bombings, coral reefs at Molokini were harmed up to the 1970s by divers who commercially harvested black coral, much of which would eventually end up in high-end jewelry stores. In 1977, Molokini (and 77 acres surrounding it) was established as a Marine Life Conservation District. Home to dozens of species of coral and hundreds of species of fish—many of them endemic—the reef and the ecosystem it supports has thrived since becoming a protected entity. As of present day, despite its mutilated appearance due to the bombings, Molokini is primary known as a world-famous snorkel destination for visitors to Maui County. In an effort to handle the large number of visitors who go to Molokini daily, the Hawaii Department of Land and Natural Resources limited the number of permits issued to tour company operators, and as a means of preventing tour operators for laying anchor, which would damage the reef, they established a day-use mooring system. For more details on Molokini history, click here.